Red spruce (Picea rubens Sarg.) and American beech (Fagus grandifolia Ehrh.) nutritional imbalances observed during 1998–2000 in response to nitrogen additions beginning in 1989 at Bear Brook Watershed in Maine, USA, were reversed by 2013. However, nitrogen-containing metabolites continued to accumulate to detoxify ammonia. While sugar maple (Acer saccharum Marsh.) was N-limited and benefitted from N+S additions, spruce and birch established new homeostatic status via adjusting cellular metabolism. Increased deposition of atmospheric N leads to changes in forest productivity. Effects of added N+S on changes in cellular metabolism will yield information on species-specific sensitivity to N+S. To evaluate foliar metabolic changes in American beech (Fagus grandifolia Ehrh. ), sugar maple (Acer saccharum Marsh. ), and red spruce (Picea rubens Sarg.) that were exposed to ammonium sulfate [(NH4)2SO4); ~ 28.8 kg S ha−1 yr−1 and 25.2 kg N ha−1 yr−1] additions at West Bear Watershed (WBW) starting in 1989 until the end of this experiment, while East Bear Watershed served as a reference. Foliage was collected in 1998–2000 and 2013. Sapwood plugs were also collected in 2013. All were analyzed for ions and metabolites using HPLC and ICP. During 1998–2000, only N+S-treated beech and spruce foliage had a reduction in Ca and Mg. All species had significantly higher content of N-rich metabolites. In 2013, ammonia detoxification continued in the absence of nutrient deficiencies. Significant changes in growth promoting metabolites occurred only in maple throughout this study. Metabolic changes indicated that sugar maple at this site was and still is N-limited, whereas red spruce and American beech had to make metabolic adjustments in order to survive under chronic N+S inputs. 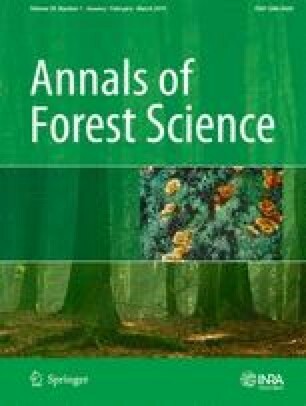 We conclude that even in the absence of knowledge about individual species tolerance limits for nutrients and critical N load for the site, monitoring with a suite of metabolites that are centrally connected to both C and N pathways could be a very useful tool in assessing stress from nutrient imbalance in various tree species. The online version of this article ( https://doi.org/10.1007/s13595-019-0808-0) contains supplementary material, which is available to authorized users. The authors are grateful to Dr. Walter Shortle, Dr. Gabriela Martinez, and Prof. Subhash Minocha for their suggestions at various steps in data analysis and/or to improve the manuscript; to the field crew for help in sample collection; and to Kenneth R. Dudzik for technical assistance. Rakesh Minocha designed and wrote the manuscript with assistance from Swathi Turlapati (postdoctoral fellow) who also helped process some data. Stephanie Long (senior technician) helped with field collections and analyses, processing of all metabolic data. Ivan Fernandez helped with manuscript writing and editing and field collections of 2013. This work was funded by the USDA Forest Service. The authors of this work do not have any conflict of interest statement.